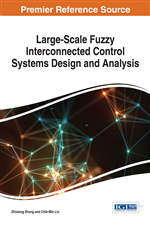 This chapter studies the asymptotic stability of large-scale fuzzy interconnected systems. It firstly focused on the general stability analysis. Then, by using some bounding techniques, the fuzzy rules in interconnections to other subsystems are eliminated. Such condition leads to a reduced number of LMIs. Also, we will present the stability result for the discrete-time case. Finally, we give several examples to illustrate the use of corresponding results. This section will derive the general stability conditions for large-scale T-S fuzzy interconnected systems. (1) where , is the number of the subsystems. For the -th subsystem, is the -th fuzzy inference rule; is the number of inference rules; are fuzzy sets; denotes the system state; are the measurable variables; is the -th local model; denotes the nonlinear interconnection of the -th and -th subsystems for the -th local model. (2) where is the grade of membership of in . Here we will denote for brevity. Before moving on, we give the following lemma which will be used to derive the main results. Thus, this proof is completed.